Highsky is a boutique hotel located in the heart of Whitefield, one of the biggest business hubs of Bangalore. The hotel offers the right blend of comfort, convenience, and luxury. Be it business or leisure, the property is perfect for guests who want to experience a comfortable stay with high class amenities. A lot of attention has been paid to the details while designing the rooms and interiors at other parts of the hotel. When you stay with us, expect to see royal designs with a hint of modernity in our interiors. Nothing says comfort like the superiors rooms at our property. 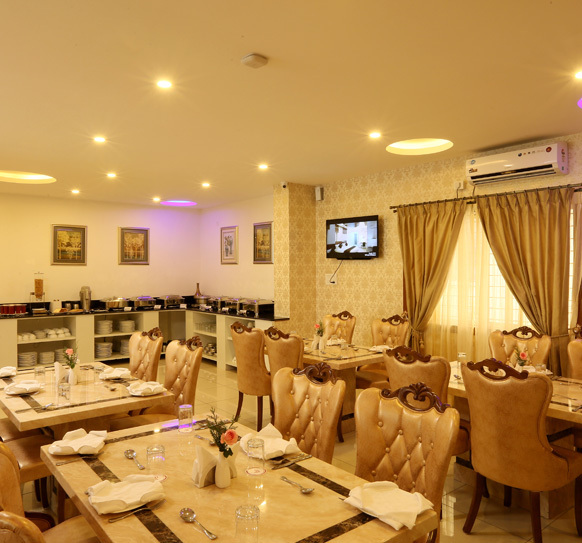 The rooms are well furnished with all amenities that one would need during their stay. Deluxe rooms are perfect for guests who want a hint of splendor in their rooms. These rooms offer comfortable accommodation with contemporary interiors. These suites exude royalty with their regal interiors and lush furnishing. These suites will make anyone feel like royalty from the moment they step into the room. Our chefs tailor make the dishes to suit the guest’s taste preference. Start with a breakfast that is bound to kick start your day. The rooftop cafe overlooking the city is the perfect place to relax at with a sweet beverage and snacks. Specially appointed conference halls for all your business meetings and conferences, comes with audio visual equipments. Expect nothing but the best of hospitality and service when you stay with us. We believe you deserve the best and leave no stone unturned in delivering the same. Highsky was established to offer a fancy and comfortable stay at a reasonable price in Whitefield. One of Bengaluru's best-loved hotels, Hotel HighSky Whitefield is recognized as one of Avalon's leading hotels with gracious island hospitality, thoughtful amenities and distinctive .